If any of you are Philadelphia Eagles fans, I feel for you! My hubby, a long tine Eagles fan is catching hell from his so-called friends today. Oh my! Being an Eagles fan is not easy. Today is rest day for me. Well… not exactly rest from everything, but rest from weight training and CrossFit. Yesterday was leg day at the gym and I am a little sore. I know my legs are the strongest muscles on my body. At their sorest (if there is such a word) they are never as sore as my arms and shoulders post workout. My blog description talks about trying to find “balance” in my life. It’s tough, but I am not complaining. I just make it work. Though I woke at 8:30 a.m. this morning, I lounged around for a few and cleaned out my junky nightstand draw. The “lounging” around set me back, but I’ve come to accept the fact that setbacks are simply part of my norm. Typically it goes something like having a to-do list of about 10 items or more. There’s no way in hell, everything is getting crossed off the list. So I prioritize what’s most important and chip away at it like that. Whatever is left on the list, I will tackle another day. Lounging recharges my battery. One good night of 7-8 hours sleep and waking without an alarm clock at 4:30 a.m. puts me in the energy bunny mode. I go on and on and on…. Lol! As I write this, I am also cooking my meals for the week and figuring out tonight’s dinner for my family. 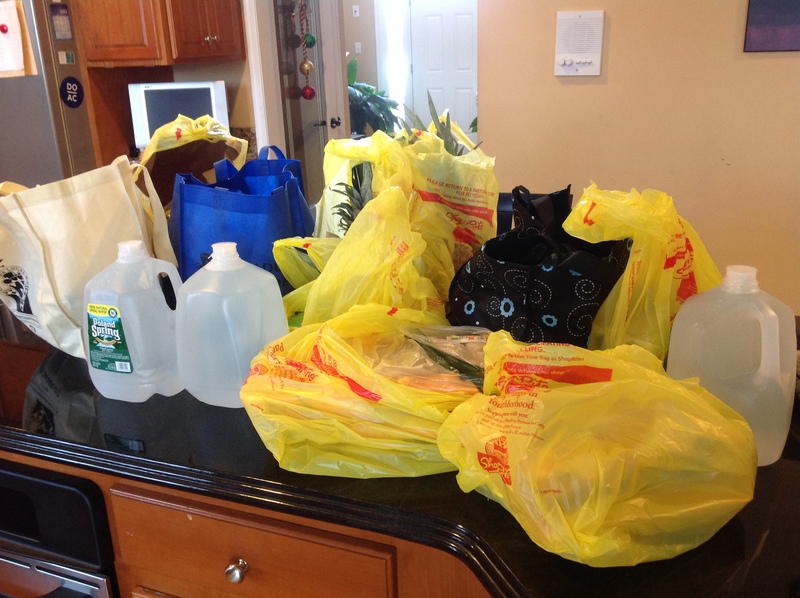 Parts of my “mini” grocery haul still sit on the kitchen counter. 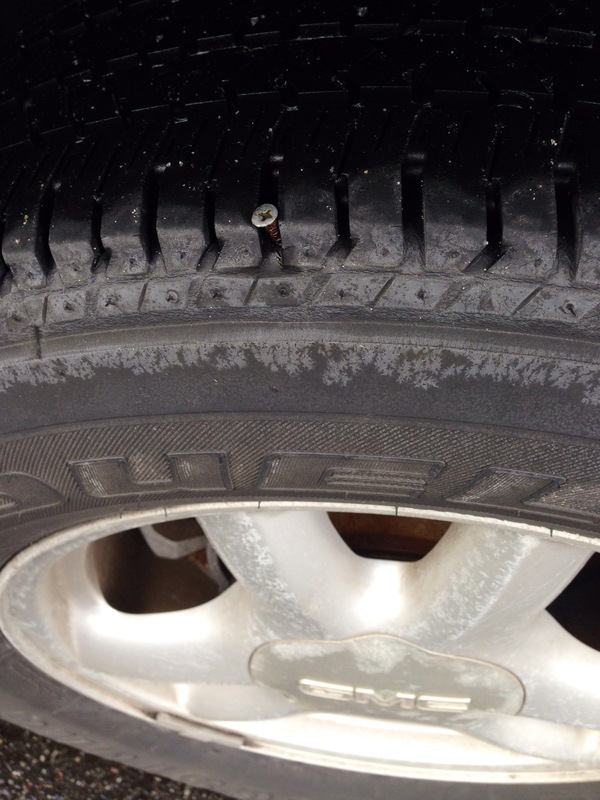 While shopping this afternoon, my son discovered this nail in my tire. I need to get his fixed ASAP! I hope my tire isn’t flat tomorrow morning. SuperSoul Sunday plays in the background and I leisurely move from computer to stove, to oven, to fridge and so on…. Y’all cookers out there know exactly what I’m doing. I just finished tossing my steel oats in the crock-pot, white baked potatoes (for my peeps) and plain sweet potatoes (all mine) in the oven. Next on the list…. Ugh! Chicken drum sticks for my family and boneless, skinless chicken breast for me. Ugh, because of the clean up after I’m done. I bleach out every part of the kitchen sink and around it. There will be no cross contamination in my kitchen! I haven’t made zucchini cakes in about a month, so I picked up four decent size ones at the produce store. During the winter months, medium to large size zucchini are hard to find in South Jersey. What else? Broccoli, broccoli rabe, mixed vegetables, a pot of quinoa, brown rice, and small whole wheat buck wheat pan cakes– No syrup thank you. A friend recently hipped me to these. Yum! Oh yeah, I have to slice up two fresh pineapples. I hate doing this, but I like to keep fresh pineapples in the fridge. They are great in smoothies and are good for you. Read more about pineapples here. Well, I really need to get back to my cooking. I will chat with you later. Tomorrow is a busy day. After work, I’m headed straight to the gym, then later, B’Dazzle (my son) has a basketball game. The holidays are over and it’s back to the grind. Talk to you later and thanks for stopping by! This entry was posted in Family Living, Fitness, Healthy Eating, Healthy Living, Inspiration, Uncategorized and tagged cooking, family living, Fitness and figure competition, food prep, groceries, grocery shopping, Philadelphia Eagles, planning, preparation, training, working mom. workout. Bookmark the permalink.